I Don’t Have to Tell You, You Know I Love Pink! I grew up, essentially, with 5 brothers (my two sisters are 11 years older and 11 years younger). I was a tomboy from the get-go. I had to just to survive! Although my mother did her best to try to get me to be feminine, I rarely did. 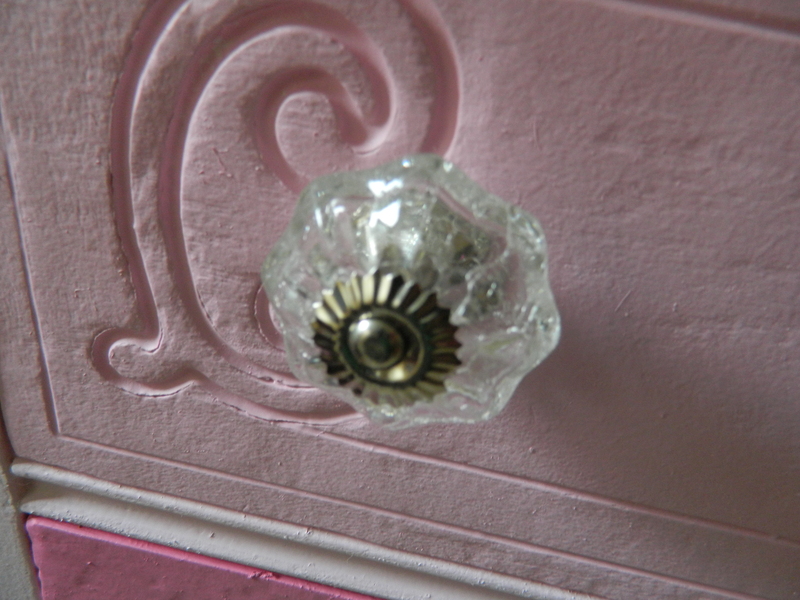 When she bought and hung two toned pink curtains in my room, I revolted. For years, I hated pink. That would all change – or so I thought – when I had children. But mother nature was tough and long story short, five years and the cost of a new house, I was able to bring my one and only child into the world: my son The Kid. There would be no pink and taffeta and dolls and tea sets and tulle and ballerina slippers. Just my rough and tumble little boy. I wouldn’t trade a single second of having him in my life, it has been the best toughest joy of my life. 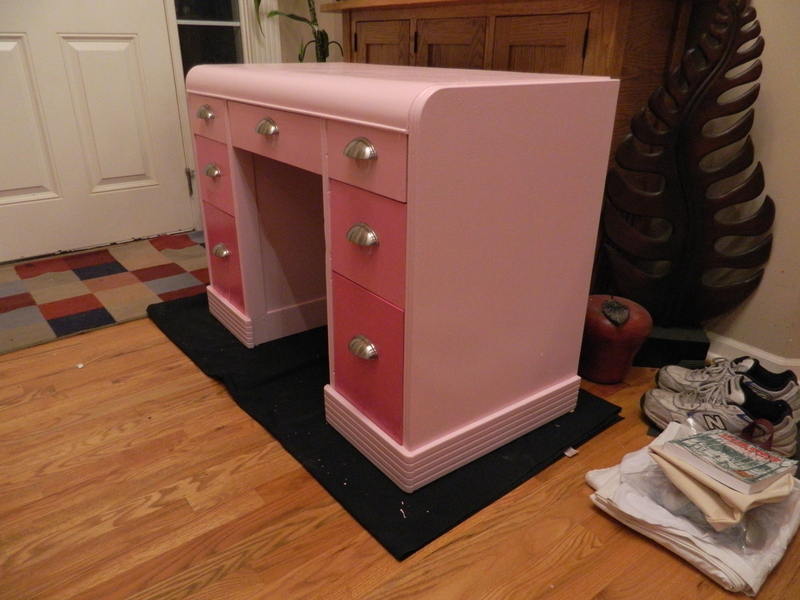 Lately, a lot of the furniture makeovers have been pink. As you may (or may not) know, I stumbled over the ombre style of painting and I’ve done a bit: black, green, blue, and yes, pink. And guess what? 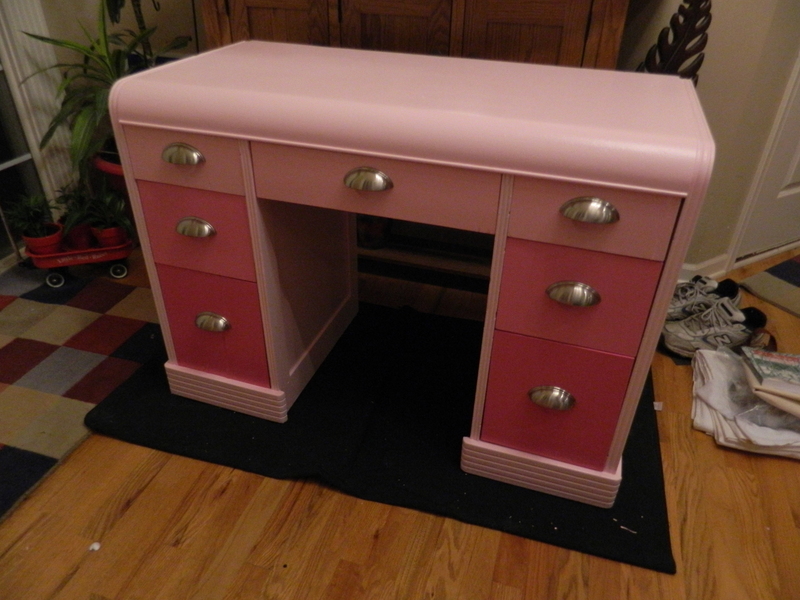 Pink sells the best and fastest and generally speaking, for asking price. It just is so adorable! 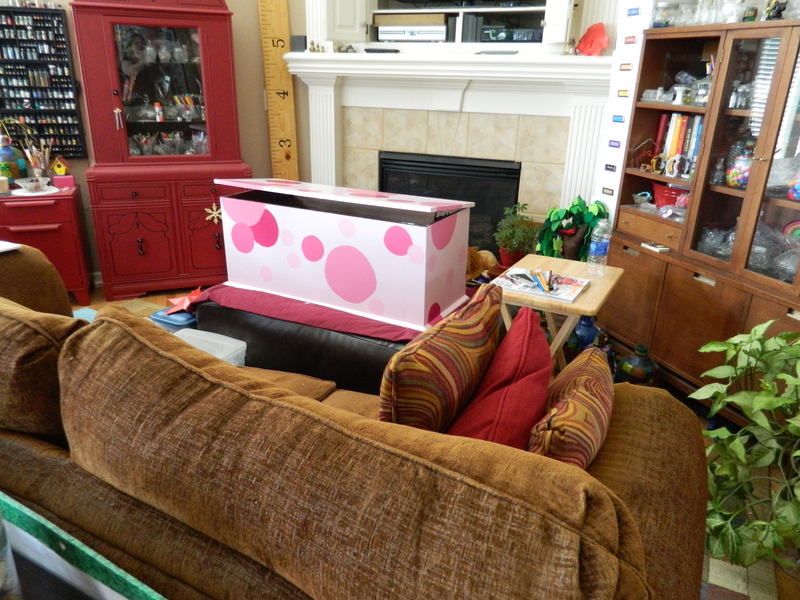 So, currently, I have a toy box and a small desk that are just about ready to be listed for sale. 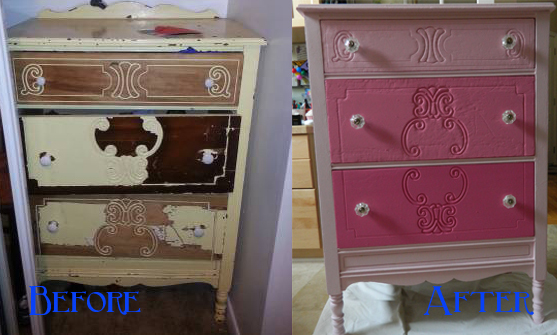 And I am forever hunting for cheap (preferably free) pieces of furniture to refinish/redecorate. Last time I bought paint, I opted for high gloss, which those little paint the small paint samples don’t come in that finish… so in order to get all those shades, I had to buy quarts (and a gallon of the base color). That means, in order to get my money’s worth, I need to do a few more. The pink is just so cheery and feminine. 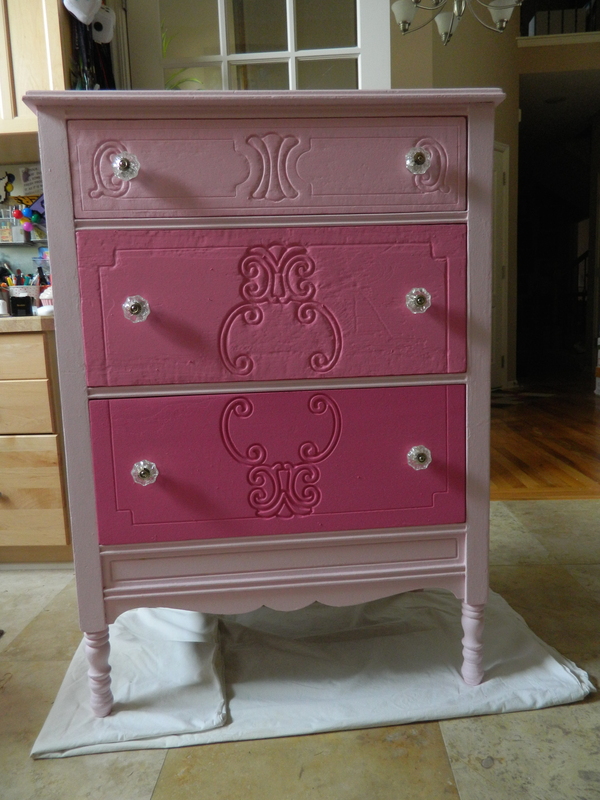 It looks perfect in a nursery, a toddler or little girl’s room… heck, even teenaged girls love pink (some opt for purple!). I actually know that at least one piece I sold was going into a little girl’s room who was trapped inside a 40’s something woman’s body! Ha! Power to the spirit of the little girl who lives inside all women! Recently, I picked up a small wood dresser. I like the detailing on the front and thought it would make a good project. It was in terrible condition when I got it and even with a lot of sanding, I couldn’t get it to a clean slate. So, I opted to paint it as it stood and in the end, it turned out okay. I like to describe it as having character. A thing doesn’t exist for that many years and not take on some blemishes or dings. This was the last one done with the satin finish. 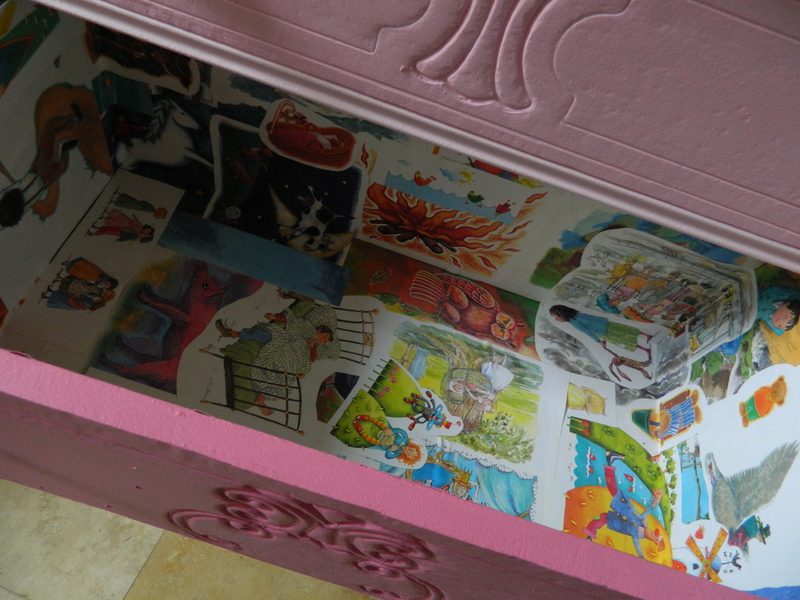 I also decoupaged the inside of each drawer using illustrations I cut from an old children’s book of fairy tales. It sold quickly, like this style does. So, more are on the way. I think a few people have figured out my success as I am seeing more of the ombré style recently. Added a sweet touch with these crystal handles. Keep an eye peeled for unveiling of several pieces soon. 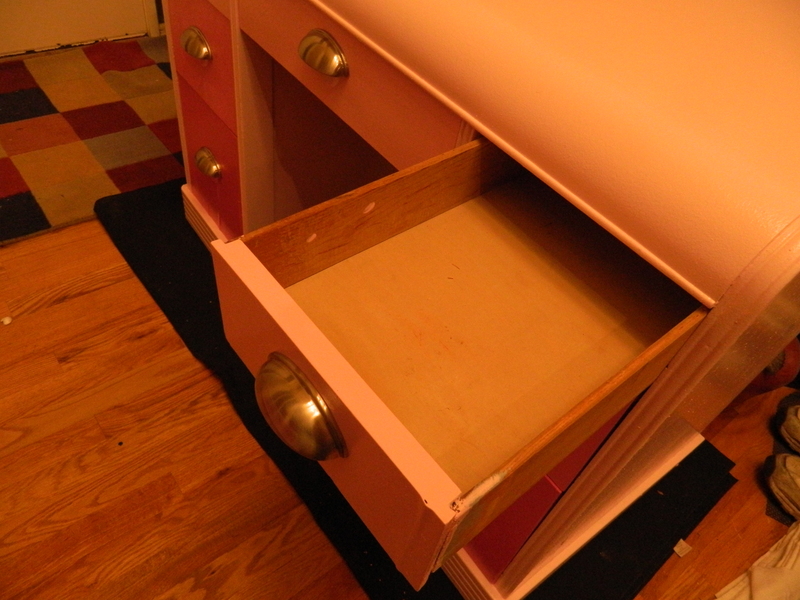 I am also working on a desk converted to a tall chest of drawers, The Kid’s Victrola makeover and the restoration of the larger Victrola. And of course, I am always on the lookout for things that get the creative juice flowing. Recently, I went back to work. Full time. With a commute. I lost, effectively, about 50 hours a week that I used to spend hunting down pieces to work on and actually working on them. And writing this blog. And once I’ve been off and used to sleeping enough and tailoring my days as I wanted. Weekends are now a blur of intent, planning and trying to have some sort of life. I was able to finish a couple of things, and am madly trying to get this post done so that I can still have part of a weekend to relax. I am sure that my blogs will be, for a while anyway, a little more sparse. I will have The Kid help with a lot more this time around, but in the end it will be my inspiration and plan and execution, he will just help with the ‘heavy lifting’. Beginning last summer, I have been collecting these little toy glockenspiels, ostensibly for the metal bars. I have seen them in a couple of places, keep your eyes peeled in the toy section of your favorite thrift stores. Side note: While writing this piece, I kept referring to the toys as xylophones, but now know that they are called glockenspiels. 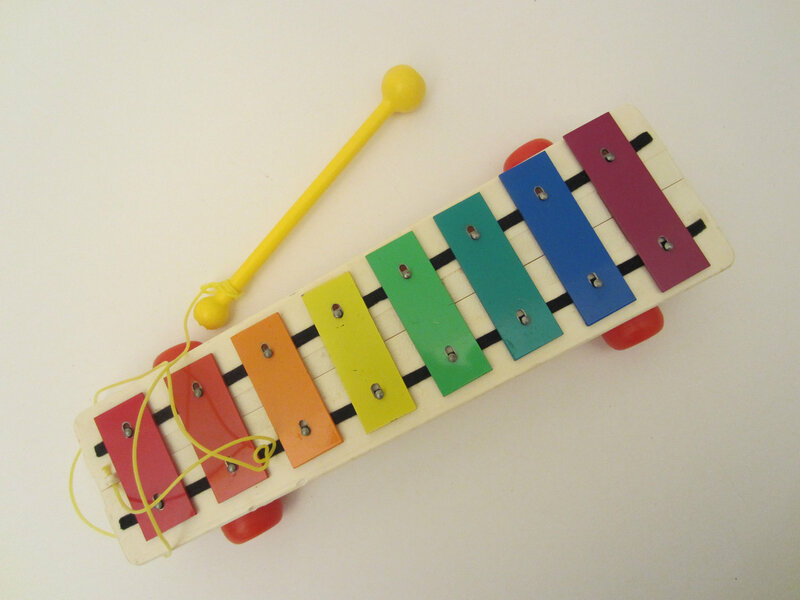 Xylophones have wood bars to strike, while a glockenspiel has metal. So, I had two that are in the shapes of alligators and one more traditional shaped. But I really just wanted them for the metal bars. I finally got around last week to making the chimes. It was pretty pretty easy to just brute force these apart, as it wasn’t really intended to come apart. I also kept the things you use to hit the bars with, they would become the clangers in the chimes. The biggest hurdle I faced was what to use as the base of the chime. In one of our recent thrifting experiences, I ran across this thing, and to tell you the truth, I don’t know what it is or what it was used for. 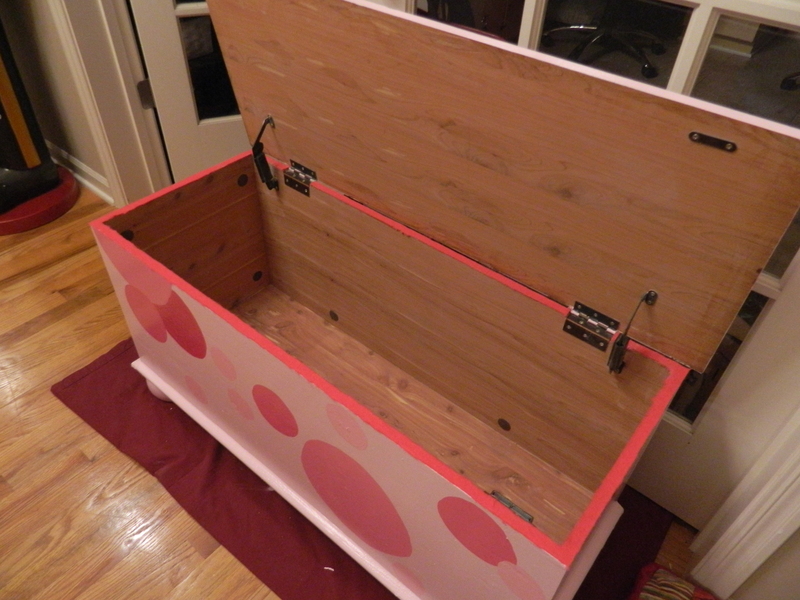 But one look at the pattern of holes and I knew it would work perfect for me. From there is was just a matter of looping the string through. I used a nylon coated cord, I have found with other chimes, this seems to last the longest. I’ve been repairing chimes for as long as I can remember, lots of the ones that I have hanging along the eves were pricey, I mean upwards and over the hundred dollar mark. I love the long, wide tubes, as they ‘bong’ instead of ‘clink’… much like church organ pipes. So, when one breaks, I fix it. Recently, I used the tubes from about 6 or 7 chimes making one big one, and it is wonderful. If you want to see that post, go here. 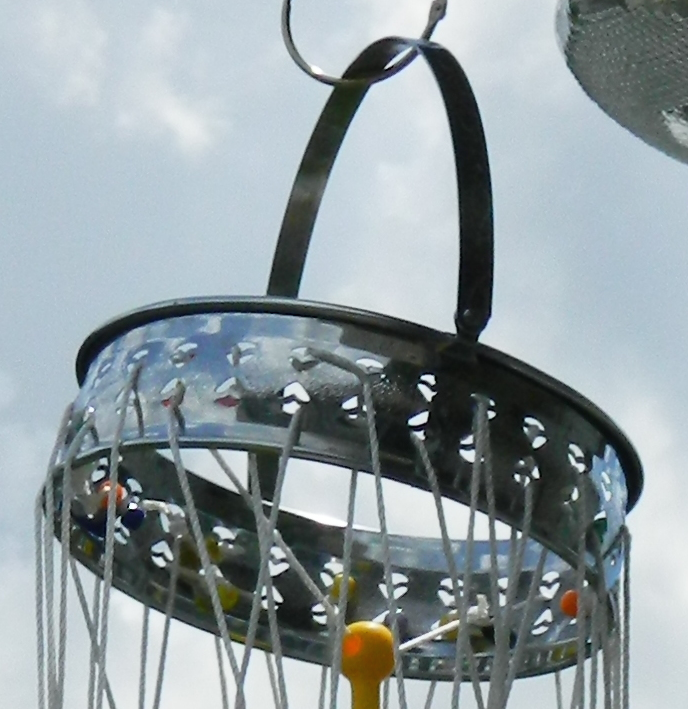 Because I had a fair amount of the metal bars, I opted for a two tiered chime. The clangers are the actual clangers (what else would you call them?) just by drilling a hole in the top ball. It all came together very nicely. Then I repaired these two chimes and rehung them. I am back to almost full eves on both sides, one by the master bedroom and the other by the kitchen. We’ve had our share of windy days lately and I love the music that plays. 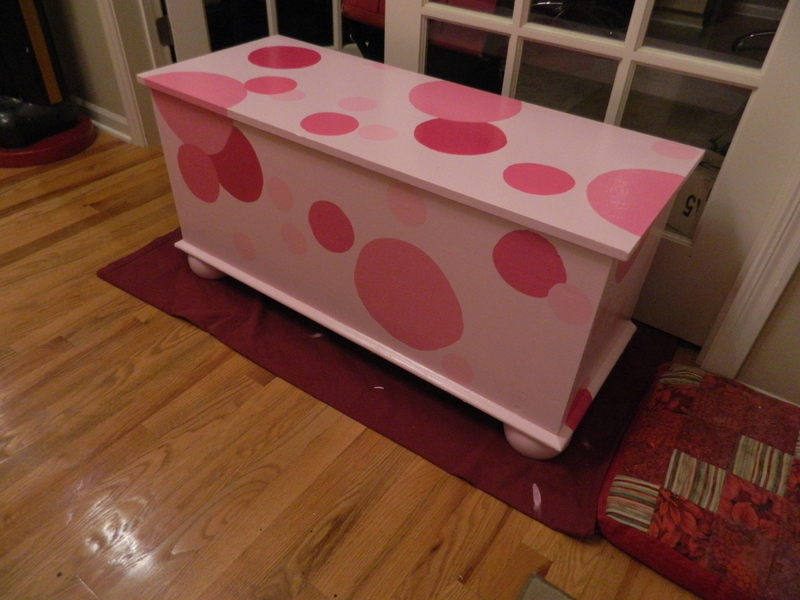 I’ve been working on a toy box, in my signature ombré color style and had The Kid move it into the living room so that I could paint the circles while watching television. Close to being done, but here is a sneak peak. Okay, I need to actually get some more projects finished, but I am seriously wanting to just kick back and put my feet up! Wonder if I can do both?